Call me boring and predictable, but my Desert Island cake would undoubtedly be chocolate. Even long after falling under the spell of swaying palm trees and a cool salt scented breeze, some of us still need our daily chocolate fix. As soon as I wade ashore, marooned with my 2 chickens (eggs), a cow (for cream and butter) and, somehow, the knowledge of how to cobble together a working oven out of coconut husks and sheer determination, a cake would be baking and a kettle brewing for tea. Paradise sorted. The cake is from Rose Levy Beranbaum’s Heavenly Cakes cookbook. If you haven’t yet gotten the book (and you really should), you can also find an adapted version of the recipe here. 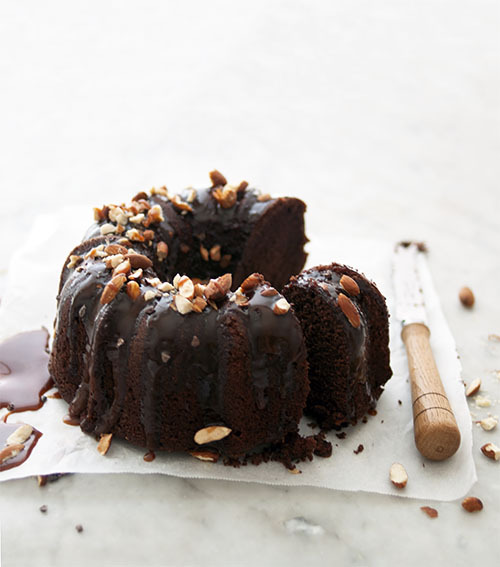 On its own, the cake is moist, perfectly chocolatey and really doesn’t need dressing up. But if you want to take the cake from desert island to dessert island, a casual drizzle of warm salted caramel and sprinkle of chopped almonds certainly wouldn’t go astray. Melt the sugar and liquid glucose in a medium-large pot. Cook until it caramelises (you want it a nice dark colour, but not burnt). Turn the heat off, carefully add in the cream (the mixture will splutter), vanilla, butter, lemon juice and salt. Whisk until combined, then strain into a heatproof bowl and allow to cool before using. 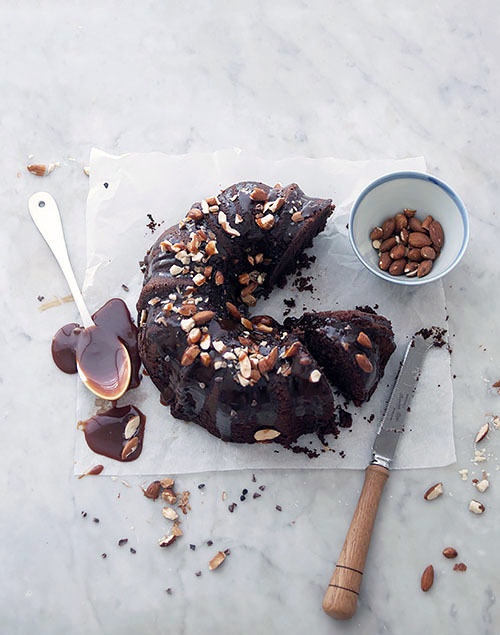 Just before serving, drizzle onto cake (you can warm the sauce up a little if need be) and top with chopped toasted almonds.